Clinton’s popular vote “margin” is a myth: the Recorded vote is always fraudulent. Those who cite Clinton’s lead in the popular vote fall into the same old media-driven TRAP. They fail to realize the FACT that the recorded vote is ALWAYS fraudulent – as it was in this election. The True Vote Model indicates Trump won the popular as well as the electoral vote. The primaries were rigged in favor of Clinton. The odds: 77 billion to one – based on exit poll discrepancies. But the 2016 election was different. The corporate media (the National Election Pool) which funds the pollster’s pre-election and exit polls were heavily biased in favor of Clinton. Election analysts calculated that Clinton won the Electoral vote by 302-236 based on unadjusted exit polls. The states that Clinton won the unadjusted exit poll and Trump won the recorded vote were WI, NC, MI and PA. The analysts failed to consider that Trump won the MN unadjusted exit poll, and therefore Clinton won by 292-242 EV. But the analysts assumed that the exit polls were fairly conducted. Just because unadjusted exit polls were excellent indicators of fraud in the past does not mean that they were in 2016. These tables display a summary of 9 states. They show that a) the Democratic Party-ID share was inflated compared to the estimated Party-ID based on the Gallup survey and b) the unadjusted exit polls over-weighted Clinton’s share of Independents compared to the Reported and True Vote. 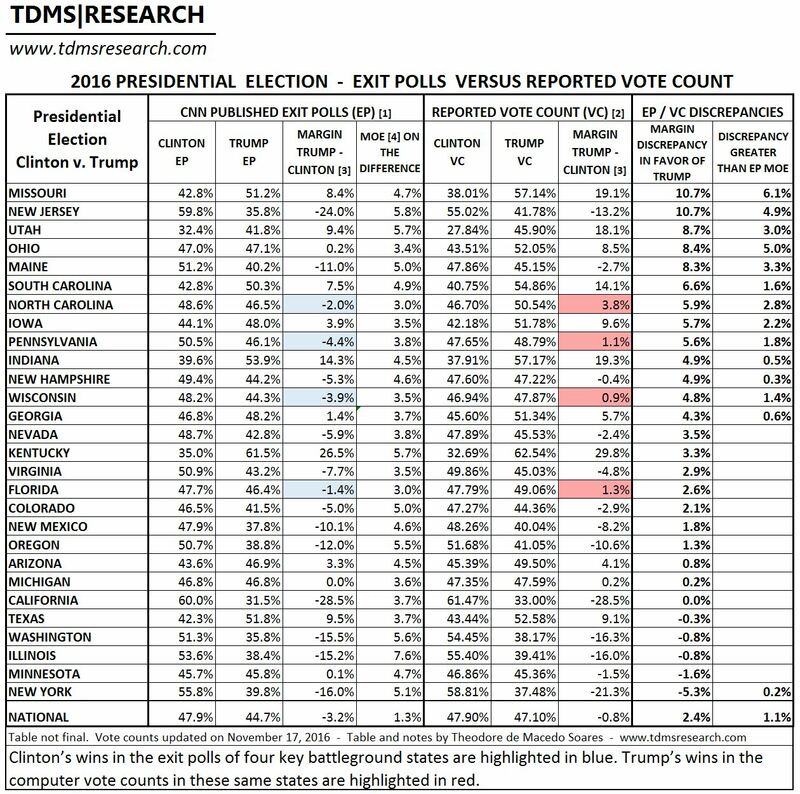 As a result, Clinton’s unadjusted vote share was inflated, showing her winning the unadjusted exit poll average by 2.6% while losing the Reported and True Votes by 3.5% and 3.6%, respectively. An analysis of 274 state and 6 national unadjusted exit polls from 1988-2008 prove systemic election fraud beyond any doubt (the odds are trillions to one) as well as in the 2016 primaries. Recall the 2004 stolen election in which Bush defeated Kerry by 50.7-48.3% ( 3 million bogus popular votes)- which was promoted all over the media. Kerry actually won the True vote by 6-10 million (he had 51-53.5%). Bush did not want a repeat of the 2000 election in which Gore won the official (bogus) popular vote by 540,000 (he actually won by 3-4 million). Bush needed to win the popular vote in 2004, so his vote share was padded in big states that Kerry won easily- like NY and CA.